updated, this book summarizes theory and research on ways in which humans experience nature; it explores people’s conceptions of nature and environmental problems, their relationship with nature, and their moral lenses on nature; and examines ways to encourage conservation-oriented behavior at both individual and societal levels. Throughout, the authors integrate a wide body of research demonstrating the role of psychology in promoting a more sustainable relationship between humans and nature. New sections cover human perceptions of environmental problems, new examples of community-based conservation, and a “positive psychology” perspective that emphasizes the relevance of nature to human resilience. Additional references are to be found throughout this edition along with some new examples and a reorganisation of chapters in response to reader feedback. 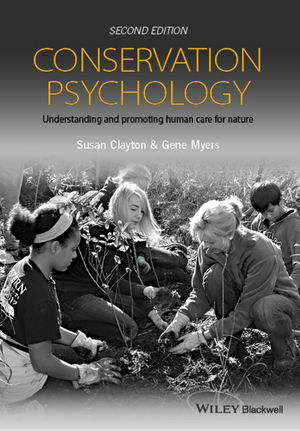 This fascinating volume is used for teaching classes to senior undergraduate and graduate students of Conservation Psychology, Environmental Psychology and Conservation Science in departments of Psychology, Geography, Environmental Science, and Ecology and Evolution. It is equally suitable as a starting point for other researchers and practitioners - psychologists, conservation biologists, environmental scientists, and policy-makers - needing to know more about how psychological research can inform their conservation work. Conservation Psychology and is president-elect of the Society for the Psychological Study of Social Issues. Her research focuses on understanding and promoting concern about environmental issues. In particular, Clayton is interested in the ways in which a relationship with nature is promoted through social interactions, and has studied these interactions in zoo settings around the world. ontogenetic development of environmental care and responsibility; the integration of positive psychology into conservation and sustainability practice; and the teaching of environmental ethics and the preparation of future environmental educators.